Extremely versatile. 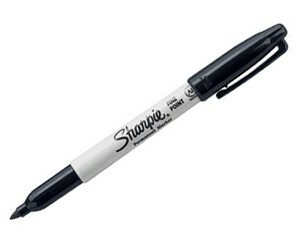 Writes on almost anything! Choose your surface — metal, cardboard, glass, plastic, foil, rubber and much more! Keep 1 with you at all times for quick and easy labeling. Fine point for clear, distinctive lines. Vibrant ink lays down smoothly, and is waterproof and smear proof to keep your words readable at all times. The tough, resilient tip won't bend or spread even if you press hard.